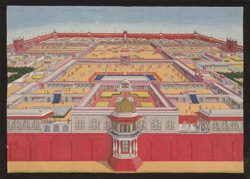 Opaque water-colour of a bird's-eye view of the Red Fort at Delhi from the east, by an anonymous artist working in the Lucknow style, c. 1780-90. This view shows an emperor, probably Shah 'Alam (1759-1806) entering the Diwan-i-Khas (Hall of Private Audience) on the right. Of the buildings in the immediate foreground, the Rang Mahal (Colour Palace) is on the left, the Khwabgah Jharoka (Place of Dreams Balcony) in the centre, and the Moti Masjid (Pearl Mosque) on the extreme right. The Red Fort or Lal Qila, was constructed by Shah Jahan (r.1627-58) for his new city of Shahjahanabad. The octogonal-shaped fort complex is surrounded by high fortification walls of red sandstone which reach between 18-33 metres in height. Other key buildings inside the fort include the Diwan-i-Am (Hall of Public Audience) and the Khas Mahal (private chambers of the emperor).